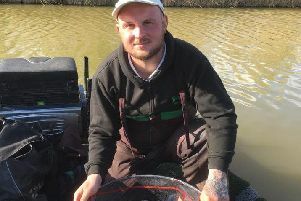 Lionel Whaley won the Yaxley match with 11lb 10oz of roach. Photo: � Paul Marriott Photography. This year’s East Midland Winter League has been one of the best for many years with a string of double-figure weights regularly recorded. With just one match to go on the Factory Bank and the Old Nene at Benwick even more big nets of fish are expected. The big practice match for the final round of the league, which takes place this Sunday, once again saw in-form Factory Bank produce the goods with the top six anglers pegged there. Benwick also chipped in with some good backing weights. Sensas Mark One rod John Price took the top spot. He fished pinkie over groundbait down the middle taking roach to 4oz to put 20lb to the scales. Drawn on the next peg and matching the winner almost fish for fish throughout the bitterly cold day was Dave Rowell. The Stanjay-backed rod fished similar tactics to the winner finishing just short on 19lb 9oz. Ricky Young came in third on 18lb 12oz followed by Steve Joy with 17lb 8oz. With both the Old Nene and Benwick in such good form it’s hard to predict an upset on the team front in the final match. Maver Image, one of the top teams in the country right now, have a two-point advantage over Sensas Mark One and I think that’s the way it’s going to end up. There was also some very disappointing news for the teams and anglers at the weekend as league secretary Roy Whincup announced that he will be standing down at this year’s AGM. He has decided to concentrate on his fishing again, something that was very hard to do with the full commitment of running a very successful league. It might not sound too dramatic but he is, or should I say was, without doubt one of the best secretaries the league has ever had. Of course he has made a few mistakes but they pale into insignificance when you consider all the hard work he has put in year after year. Ramsey AS were also on Factory Bank at the weekend and Paul Kilby finished out in front putting a fine 25lb 11oz net of roach to the scales. He had over 400 fish in his net at the end of the day - all taken down the middle of this tiny drain fishing a whip with pinkie over groundbait. Runner-up was Vern Edgley on 12lb 8oz followed by Adam Johnson on 10lb 11oz and Harry Young with 7lb 13oz. Another local water that has been very consistent over the past few weeks is the Bower at Whittlesey. In the latest Yaxley/Farcet/Holme DAA match on the venue Lionel Whaley put a net of roach to the scales weighing in at 11lb 10 oz - all taken on bread punch fished down the middle in the deep water. Ivan Marriott came in second with 6lb 14 oz and Frank Bevilacqua was third with 4lb 7 oz.